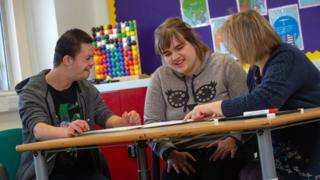 New homes and a day centre for young people with disabilities are set to open, following the closure of a council-run respite centre. Families of young disabled people in Hereford fought for two years to save No 1 Ledbury Road, eventually closed by Herefordshire Council in 2017. Charity National Star has now bought the building and plans to open long-term homes and a day centre. They said it will address the lack of residential homes for disabled people. Bungalows at the site will be converted into homes for seven young people over 18 with physical and learning disabilities and will open in autumn this year. A day centre in the main building, bought from Wye Valley NHS Trust, will be opened by summer 2020. Head of National Star at Hereford, John Mann, said the long-term homes were needed as young disabled adults were being put in old people homes. "You want young adults to be mixing with people their own age, and to be somewhere their independence is encouraged and they can be active in the community," he said. The charity is fundraising to help finance £2.2m development. Herefordshire Council said it welcomed the project.